In this list, all edit fields in the connected data group will be shown. The fields in this list will be shown in the results table as a column. Move entries from one list to the other. Set the order of the columns in the table. The following rule applies here: the higher a field is placed in the list, the further left the column will be shown in the table. Opens a dialog where the title of the column can be changed. The desired control type can be selected here to display the values in the results table. The results table will be sorted by the field entered here. Opens a dialog where the sorting can be changed. The maximum number of shown hits per table page. Shows the navigation element at the foot of the results table, which allows the user to move to additional pages of the table. 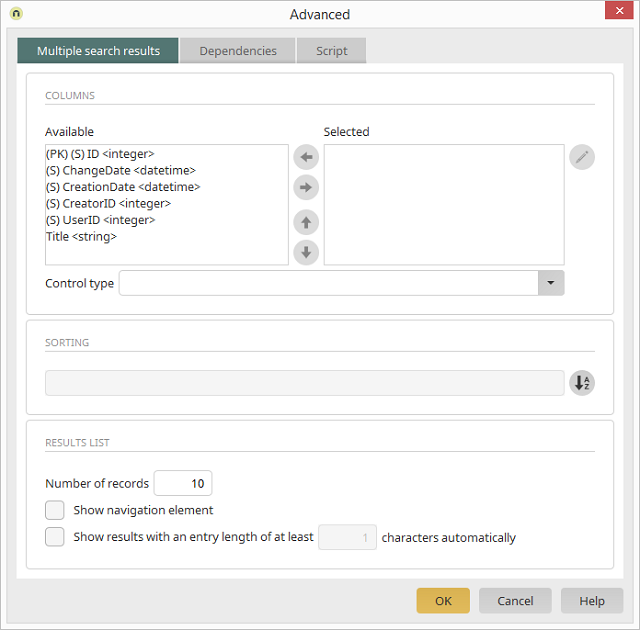 If a single result is found, it will automatically be entered into the connected fields by the Data Picker. Multiple hits will be shown as a tooltip. This setting defines after how many entered characters this tooltip will open.